I wouldn’t call myself a Guillermo del Toro fan per se. He has directed films I like very much, like Pan’s Labyrinth, Hellboy & Blade II (the best of the trilogy) and some which left me cold (Pacific Rim & Mimic). But his unique visual flare is always enough for me to take notice when his name is attached to a film. He’s a much more creative stylist than, say, Tim Burton, who’s fast-becoming a one trick pony. Unlike Burton, del Toro uses his talent to serve the story (even when he’s a director-for-hire), not vise versa. But if you’re reading this right now, you are likely already a big fan. You’re also probably wondering if Cabinet of Curiosities is a career retrospective, a biography, a behind-the-scenes look at his films or a lovingly-assembled picture book. Actually, all of the above apply, which makes this hefty (and expensive) volume somewhat unique. 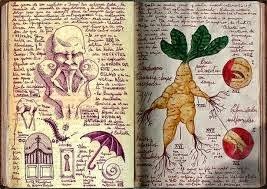 The primary focus of Cabinet of Curiosities is on the personal notebooks del Toro writes and illustrates while planning and visualizing his films. The book is filled with pages from these notebooks (mini works of art themselves), including a slew of original concept designs (some which made it to the screen, some which didn’t). 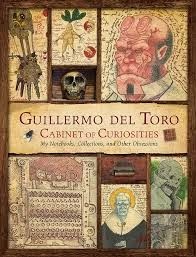 Accompanying the illustrations and scribblings are interviews with del Toro (conducted by co-author Mark Scott Zicree), as well as the occasional essay written by cast members, associate and peers. We also learn a great deal about del Toro’s formative years in early chapters…how his family, environment, various storytellers and filmmakers influenced and shaped his future. One interesting aspect of the book is del Toro’s story isn’t some rags-to-riches thing; his father won a lottery, which allowed him access to all kinds of classic literary influences. Since I’m no del Toro expert, I was especially intrigued by the section which covers Bleak House, a separate home from where he and his family live, which is filled with his personal collection of movie props, paintings, rare books and memorabilia. The place is apparently a sanctuary he visits twice a day when he’s in town, and the photos (inside and outside) are fascinating. The guy even has a replica of the demonic vehicle from that obscure 70’s kitsch classic, The Car. After reading this section, I was torn between hating the guy and worshipping him…he’s living the dream few horror fans can even fathom. All this is assembled in a large, hard-cover coffee table book of beautifully-rendered pages. However, it does help if you are a big fan of Guillermo del Toro’s work, because this book comes with a hefty price ($60 for the basic hard-cover, several hundreds more for a limited edition).